This entry was posted on January 24, 2017 by nigel borrington. 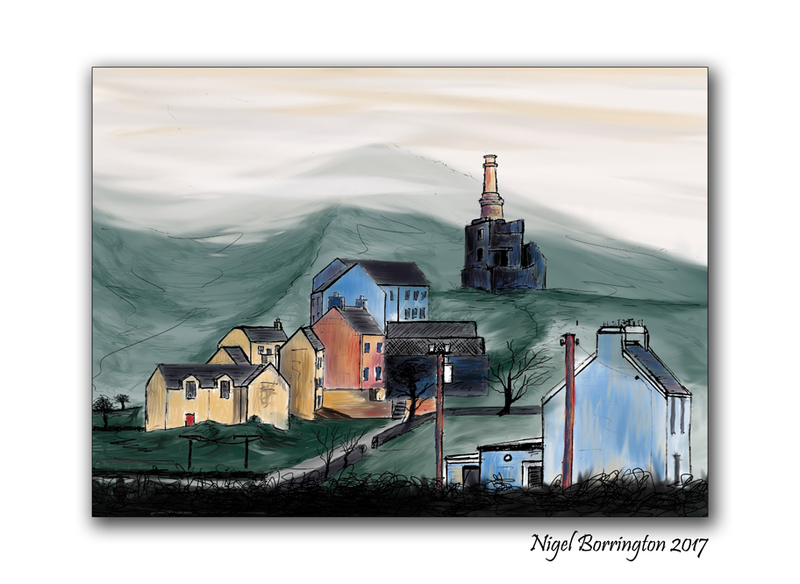 It was filed under Art and craft work, Gallery, Irish coastline, Landscape, Nigel Borrington, Travel Locations and was tagged with Allihies, Allihies copper mine visitors center, art, art work, Copper Mines, digital art, Digital art work, digital painting, landscape painting, Nigel Borrington, painting, west cork. 🙂 🙂 Thank you !! Excellent Nigel. I was in West Cork for our summer holidays last year, and you’ve captured its beauty there. Lovely Nigel and all the connections to the Copper Coast and the mining heritage here. Your artistic abilities know no bounds. Its so peaceful these days in these mining places, it is hard to even imaging what these towns looked like with the mines in full operation, completely ? I’ve done a lot of research about the mining on the Copper Coast and it’s scary at times even to think about what the miners and their families went through. Hard times, little security and safety, we have little to complain about in reality!